The information and material on this website is general information about our practice and firm. This information does not offer specific legal advice and use of this information does not create an attorney-client relationship with Ahmad, Zavitsanos, Anaipakos, Alavi & Mensing P.C. or any of its attorneys. The information on this website should not be used for legal advice, and persons should not act upon the information on this website without seeking professional legal counsel. The information and material on this website may not reflect the most current legal developments or rules, verdicts, results, or settlements, and they are not guaranteed to be correct, complete, or up-to-date. In addition, prior results in one case do not guarantee a similar outcome in another case. Ahmad, Zavitsanos, Anaipakos, Alavi & Mensing P.C. assumes no liability for the use or interpretation of the information contained herein. This publication is provided “AS IS,” WITHOUT WARRANTY OF ANY KIND, EITHER EXPRESS OR IMPLIED, INCLUDING BUT NOT LIMITED TO IMPLIED WARRANTIES OF MERCHANTABILITY, FITNESS FOR A PARTICULAR PURPOSE, OR NON-INFRINGEMENT. If you choose to communicate with us by email through this website or otherwise in connection with a matter in which we do not currently represent you, your communication may not be treated as privileged and confidential. 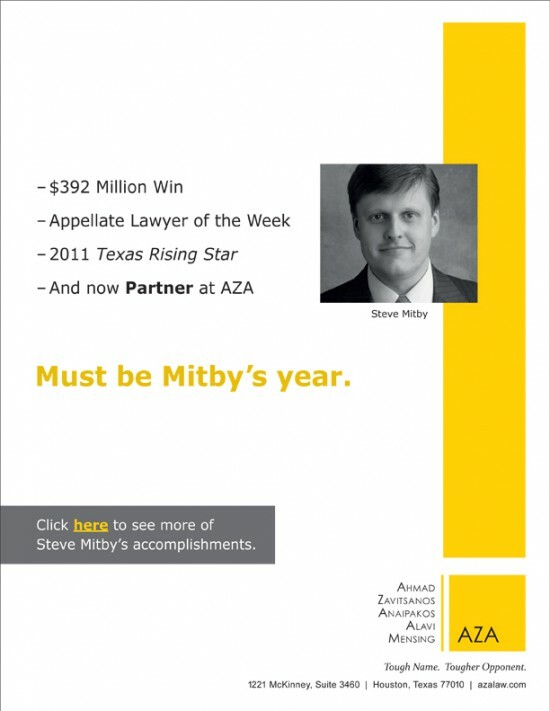 Unless otherwise indicated, attorneys listed on this website are Not Certified By the Texas Board of Legal Specialization. None of the attorneys listed on this website is certified as an “expert” or a “specialist” pursuant to any authority governing the practice of law in New York. Lawyers listed on this website are admitted to practice only in the jurisdictions listed for them.